The aunty in pink has been working as a hawker for over 40 years. As I sat near her stall chowing down a delicious plate of “hor fun” (flat white noodles), a man in his 70s came by with a bottle of beer and asked if he could sit at my table. I said: sure. Hawker centres can get incredibly crowded, and it’s common for strangers to share a table over a meal or drinks. The man’s name is John. The American kids call him Uncle John, he said, when he plays his guitar for them in the evenings. He used to be a pork butcher in this hawker centre: “very good pork”, he says with obvious pride in his craft – and he sold cooked seafood in the afternoon. His stint as a hawker was short-lived when the government confiscated all his goods because he was operating without a license. In Singapore, you cannot sell raw food and cooked food at the same stall. This rule is meant to avoid food contamination. Another rule in Singapore’s public market is that the hawker has to be personally present at their stall (to do away with landlords who sublet and raise the rents). This means that John would need to rent two stalls (in different parts of the market, since raw and cooked food are zoned far apart). Since he obviously can’t run two distant stalls at the same time, he would need to choose: raw pork or cooked seafood. After his stall got closed down, he gave up his trade altogether. He told me had cancer and lifted his shirt to show me the massive scars across his stomach and chest. He had gone for chemotherapy, and was feeling better now. Meanwhile, during this conversation, he kept asking how my plate of “hor fun” was– ” is it good? !” Absolutely – the hawker had personalized the recipe when all I said was: “No need to add any meat”. She went beyond my expectations and whipped up a mushroom soya sauce on-the-spot, instead of the meat-based sauces. This is one of the things I love about hawkers: they are not only the business owners, but they are also the Chief Chef, so they have the autonomy (and talent) to tailor the culinary experience to your delight. He insisted, and told me to pack it up to take it home to eat later, but I told him I needed to run, but that we could share a plate of rice with salted fish another day. And, hopefully, in the regularity of these shared spaces, we will meet again! 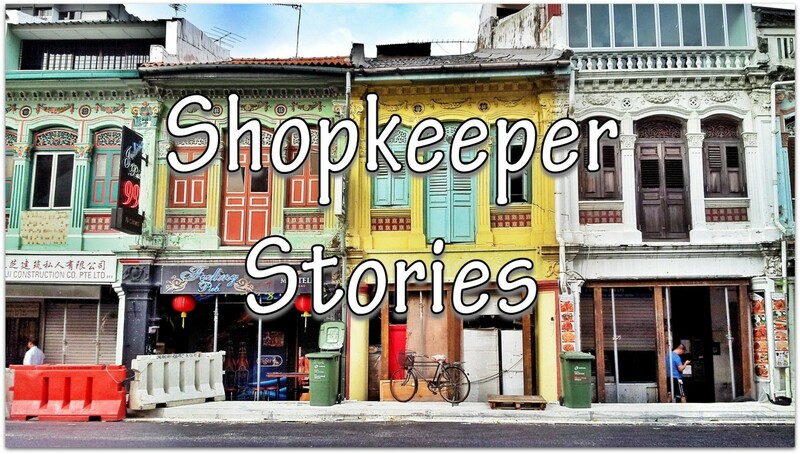 Shopkeeper Stories is a photographic documentary of small business owners with their trades around the world. You can catch all the posts on Facebook and Instagram @ShopkeeperStories. See you there! This entry was posted in Food, Singapore and tagged beer, chef, friendship, government, hawker, microenterprise, pork, seafood, small business, street food. Bookmark the permalink. I love the stories that come from shared meals. Charming profile, thanks for sharing !